Google’s Android has certainly revolutionized the smartphone landscape right from its inception. With a host of Android mobile apps, the operating system has taken mobile app development industry by the storm. Since the release of the very first Android version, it has become a favorite operating system to many all over the world. Among some of the most-talked-about Android OS; Lollipop, Marshmallow, and Nougat are the most popular. The article is going to bring an insight on these major Android versions by explaining the points of differences of the same. Before we explain the point of differences, let's have a look at these specific versions one by one starting right away from Android Lollipop. With Android Lollipop, it is easy to access the notifications from the lock screen. They are displayed as top-of-the-screen banner. There were a number of internal changes that were made by Google to this OS. One important change includes replacement of Dalvik (Software) with Android Runtime (ART). Android Marshmallow is the sixth major version to the Android operating system. Nexus was the very first device that received the update for the installation. The version was officially developed for improving the architect of its preceding operating system, Android Lollipop. Marshmallow introduced a new permission architect, new APIs, and new power manage system. Additional features include native support for fingerprint recognition, USB type-C connector and a superb ability to migrate data. Android Nougat is the seventh major version of the Android OS. Just like Android Marshmallow, the very first installation update for Nougat was made available for the Nexus phones. With Nougat, a series of changes were made for the Android development platform. One notable advancement was the change in the operating system and its development platform. A multitasking interface was also introduced with this seventh major operating system. For Android Lollipop, the basic features are same as the KitKat. The settings for Bluetooth, Wi-fi and location are very much similar to one another. In this operating system, most items in the quick setting menu are actionable. That means a feature can be enabled or disabled just by tapping the top part of it. The quick setting has also been added to Android Marshmallow. The quick setting tray in Android Marshmallow lets users add, remove or rearrange specific settings. It lets the users customize whatever appears there. In addition to this, there is doze feature to improve battery life. Android Nougat doesn’t bring anything new but there is a host of some exciting features for the users. The opportunity to set the notification manually is another exceptional feature. Customization to the setting menu is also easy with Android Nougat. Android Lollipop has pattern lock system making it easy for users to unlock their devices. The smart lock works exceptionally well with trusted Bluetooth devices. Pair your Android with any Bluetooth device to use as virtual security token system. The lock Screen comprises of call, unlock & camera icon. Android Marshmallow has fingerprint lock for the users making it easy for them to unlock their sets with just the tap of their fingerprints on the device. Such a lock pattern allows easy access to the users. Unlock and camera icons are there on the Android Marshmallow version of Android. Android Nougat has advanced fingerprint lock to protect users’ data on the phone. Additionally, “work mode” in Nougat is another exceptional security feature in this OS that allows users to disable all work-related applications. Fingerprint, camera, and microphone icons are there in this version. A new notification system has been introduced with this version of Android. There is a “priority notification” feature that rises to the notification screen to notify receivers about the vibrating alerts, be it a message or a notification alert. Users can set “always interrupt” or “allow only priority interruption” as per the need. There is a special UI tuner system. In order to set the notification icon users need to tap on the gear icon for about five seconds. The activity will set the system UI Tuner to the settings. Android Nougat offers the personalized settings to the users in order to help them set their settings as per the need. The notification system offers a number of other useful settings to the users. Android is one amazing operating system that offers a bunch of superb functionality with its every major version release. The operating system, as it is already known has some of the best functionalities that keep on escalating with every new version release. 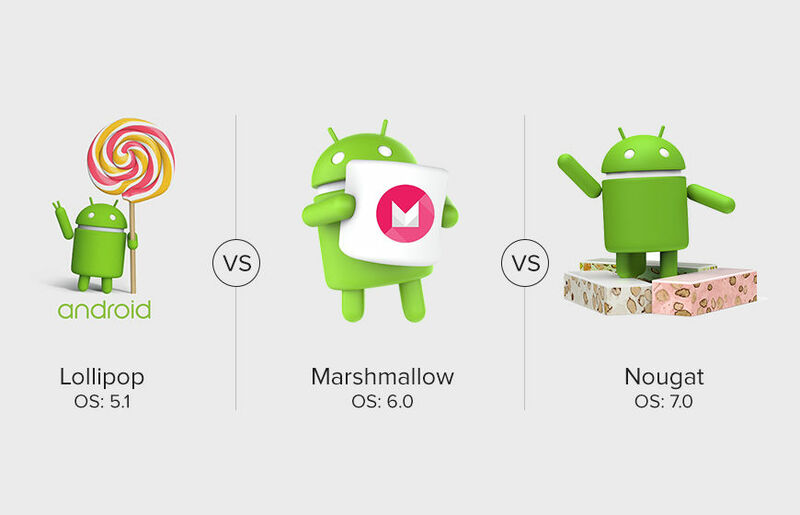 The above-illustrated comparison of different android versions showcases the giant set of features and functionalities the operating system offers to the users. What Is iPlayer And How To Access It?